In Florida, trial courts of general jurisdiction are aligned in 20 circuits. 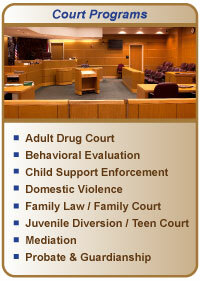 The Sixth Judicial Circuit serves citizens of Pasco and Pinellas counties. The circuit is comprised of two county courts, which have jurisdiction only in their home county, and a circuit court, with jurisdiction in both counties. All cases filed in these two counties are assigned to one of nine different court divisions.